I almost titled this post, ‘She doesn’t know any better,’ but thought that wouldn’t be fair. 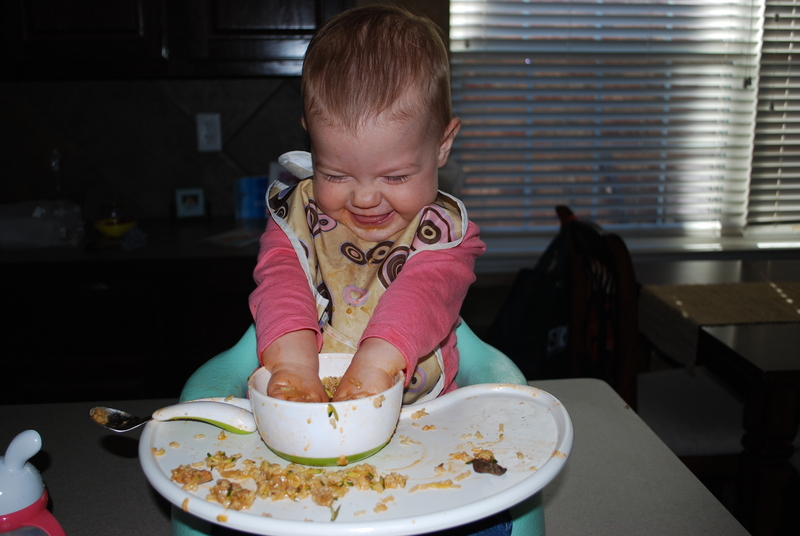 I wanted to do a post talking about the way Emma eats. Those crunchy people out there won’t really be surprised at what she eats, but most people I’ve encountered are shocked and maybe a little disgusted at what she eats, what she’s allowed to eat, and what is not mama-approved. Don’t get me wrong, we don’t eat the way I would prefer 100% of the time, after all I am human (and prego) so I allow myself off the hook now and then. During this first trimester, though, all I wanted was junk and tons of food. My nutritionist told me my body wanted protein-I randomly craved grass-fed burgers and couldn’t seem to get enough of them! Luckily, I’m not eating like a savage through the second trimester, but I do have to force myself to eat more greens. I was told I should have 3 cups of greens a day (I think that goes for everyone), and still struggle to get that much in. As for Emma, she’s pretty good at what I feed her. When I make breakfast: eggs, bacon, and sautéed spinach, she usually steals my serving and ends up asking for more. She’ll even go to the fridge and ask if we can have sardines for breakfast, knowing there are leftovers in the fridge from the day before. 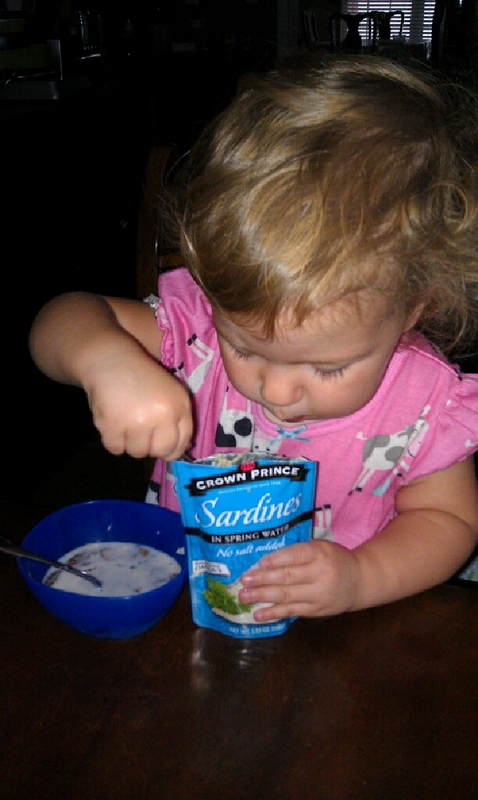 Most will balk at the thought of sardines (and I even have to force myself to eat them) especially for a 2-year old, but she doesn’t know they’re supposed to be nasty. I figure if I start her early on good sources of calcium, since we don’t do dairy, they we can stave off the osteoporosis that runs in my family. I was devastated when I found out I had osteopenia at 28, so this mama could learn a thing or two from the wee little one. 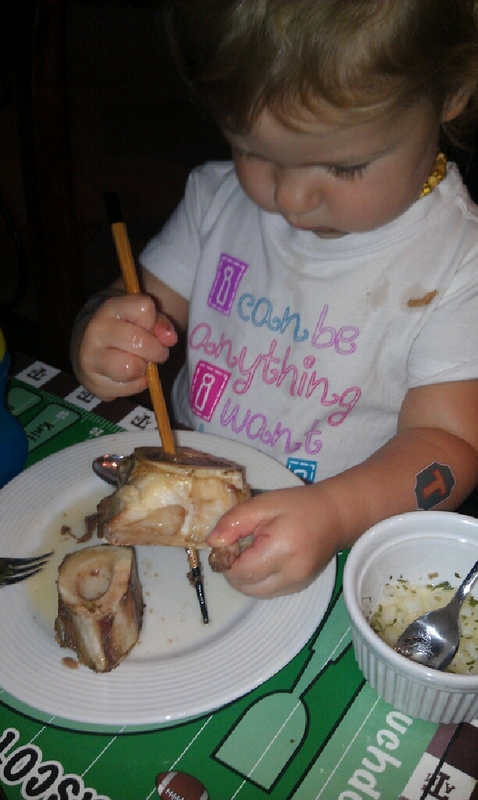 What got me to this point in how I feed her were a few reasons. When I read Primal Body, Primal Mind a year and a half ago, my world was turned upside down! I learned what our food does to us, good and bad, and knew that I needed to start her on the right path STAT. There seems to be too much junk in our food supply these days and I feel like we’re setting up our kids for illness down the road (or even sooner). I wanted to give her a fighting chance at setting the stage now, knowing I can’t control what she eats forever. 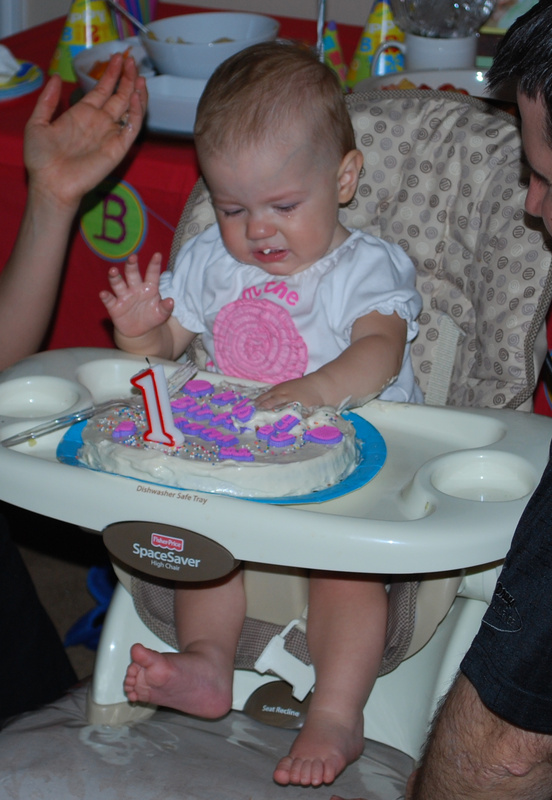 The kicker for me was probably her first birthday. 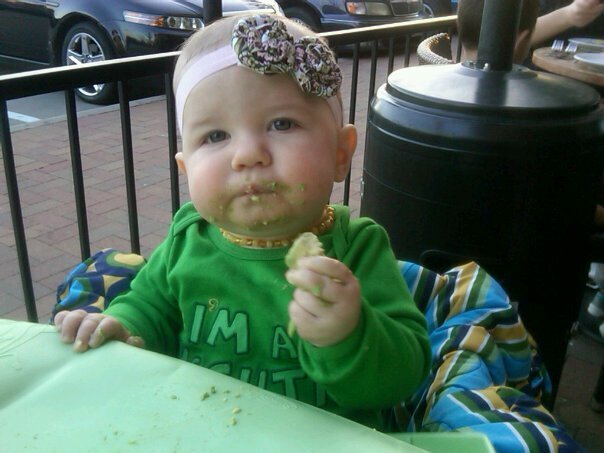 Mind you, we were all still eating grains back then, but I struggled what to do when it came time to celebrate her turning one. 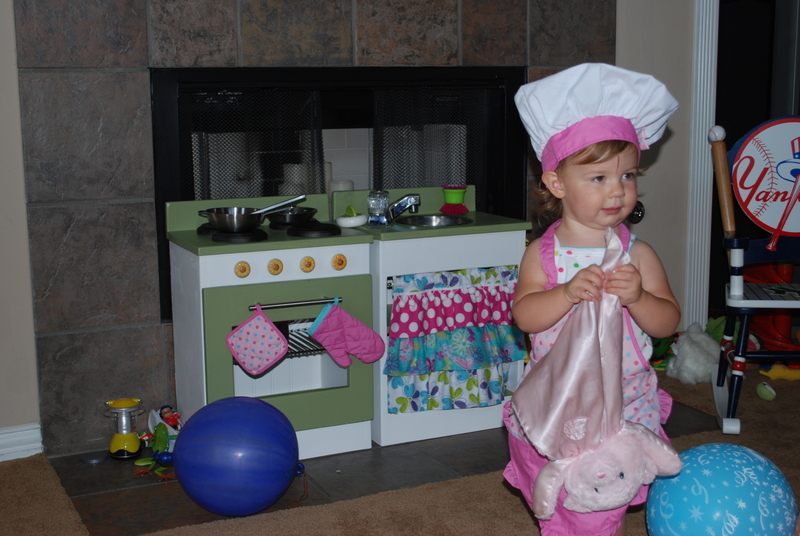 She never had sugar, unless it was fruit, in the first year of her life, so why in the world would I set a big, sugar-laden cake/cupcake in front of her for the sake of pictures? It honestly was abhorrent to me. I’m not here to judge what others do, this is the thinking that goes on in my over-analyzing brain. So, I settled on making her a Hummingbird cake (read more in this post). I fretted all the way until I set the homemade cake in front of her. Would she like it? Would she eat the whole thing? Was I a terrible mother for offering this to her when her system was still so fragile? Ironically, she wanted nothing to do with it! It could have been that she wasn’t feeling well, was over-tired, or didn’t like getting dirty, like her daddy. Either way, I was relieved. 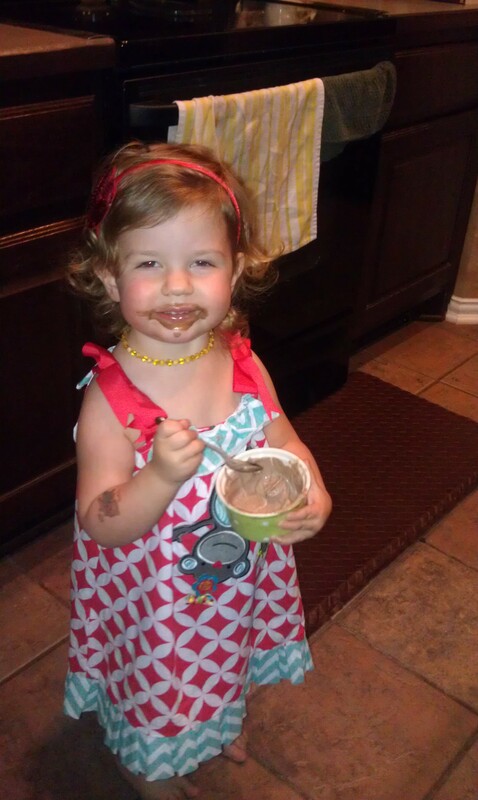 Yes, I just admitted I was happy that my one-year-old didn’t want sugar on her birthday, what can I say. Is it a bit extreme? Maybe. But that’s okay for me. It’s actually made me eat and drink better. Emma and I only consume water, hot herbal tea, and Kombucha. I don’t care to have sodas or sweet tea, knowing they cost more when eating out and do ZERO things for my body. I have to admit, once you kick the sugar habit you A) don’t want it anymore and B) will find sweet things are way too sweet. It’s been a win-win for me. My other motto is ‘Kids are blank slates, so why not expose them to the world?‘ They don’t know what’s supposed to be gross or nasty at this young age. Just because some adults don’t eat Kipper, capers, or kale chips, doesn’t mean the child needs to dislike them without being exposed to them. Emma doesn’t know what chicken nuggets, soda, or candy are and I intend to keep it that way for a long time. I want to educate her that food is fuel for our bodies and can also hurt them at the same time. I constantly tell her that water is good for us because it keeps us hydrated and cleans out the body. Ya’ll know I over-explain things to her, but I guarantee she understands and is filing it away for the future. It’s sometimes scary what kids will remember! This way of thinking has led us down a really exciting road. Our whole family is trying things I never had considered before: collard greens, sorrel, kohlrabi, sardines, bone marrow, Kombucha, organ meats, etc. I have to say it’s been fun branching out into a world I never knew. I know it helps going to Farmer’s Markets or local shops and asking the growers what certain foods are and how to prepare them. What’s even better, is with Emma being so young I can set in her mind that these foods are good for her and actually tasty. I know this will carry through with her as she starts cooking with me and when she goes out on her own. I figure I owe it to her as her mother to set a solid foundation. Maybe I’m a little obsessed with food, but that’s been my life ever since getting diagnosed with celiac disease over 30 years ago, so I can’t help it! I know it sounds a bit mushy or even overkill, but it works for us. You have to find what works best for your family and not give up! We owe it to our kids. Whoa! I had no idea this post would be this lengthy, but this topic is very important to me. Food does so many positive and negative things for our body, that if I can give my family the best possible choices, we might have a fighting chance at not getting cancers and having good health in general. What about you? Am I alone in this venture? Do you feed your kids any ‘crazy’ foods? My hope is that this gets you thinking and exploring with your kids-I promise it’s never too late to set them on the healthy path! PS-I’d like to send a shout out to my mama (Emma’s Nonna), who’s 35 years young today! Happy Birthday to the most amazing and beautiful woman I know!